After I finished University, I got my own email account. 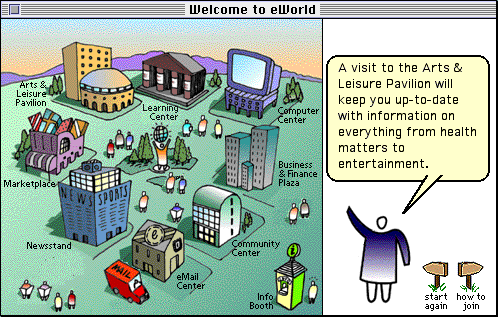 I signed up for eWorld (https://en.wikipedia.org/wiki/EWorld), the Mac version of AOL at the time. I only knew a few people with email addresses so I seldom got emails. Every night from my tiny apartment in rural Japan where I had gone to work after finishing my degree, I would dial up to a local node with my 14.4k baud modem. I wouldn’t get an email every day but I checked religiously. My main correspondent was my Mom. Spam back then was still only a canned meat product and emails were usually only text. Now, like most people, I get hundreds of emails a day. They include questions, complaints, tasks, meeting requests, and Documents… lots of documents. I would estimate that one in ten emails I receive has an attachment. I could be a document I’m working on (like this one), a Request for Proposal, a signed contract, a network diagram, or a vast number of other rich and important pieces of information. 100% of my corporate email is work related. But email is still generally private. I am sure most people would be outraged if asked to share their email with their boss or colleague. So, vast amounts of important corporate information are left in people’s inboxes. Some of it makes it to the desktop or the shared drive. Even less makes it into a corporate document management system. Even though SharePoint is one of the most widely adopted platforms, it is estimated that a very small amount of corporate information ever makes it there (AIIM Industry Watch – The Impact of SharePoint - 2016). A typical scenario we are all familiar with is the ‘save all attachments’ dance. Where we save our document somewhere familiar (often the desktop), open SharePoint in a browser, navigate to the site we think these should go, and then either attempt to drag them in or use the “upload document” button in the ribbon. With all these steps, it’s amazing anything ever actually makes it to SharePoint. So, what’s the solution? Moving things into SharePoint from mail should be easy. 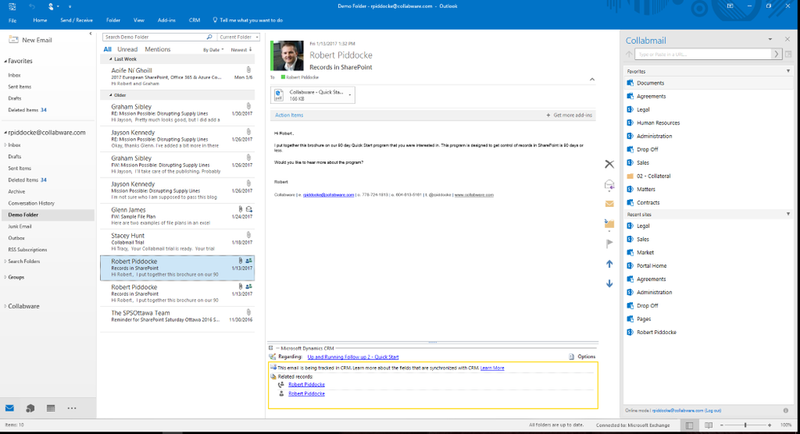 Let’s face it, Outlook is the main window into most Information Worker’s workday. 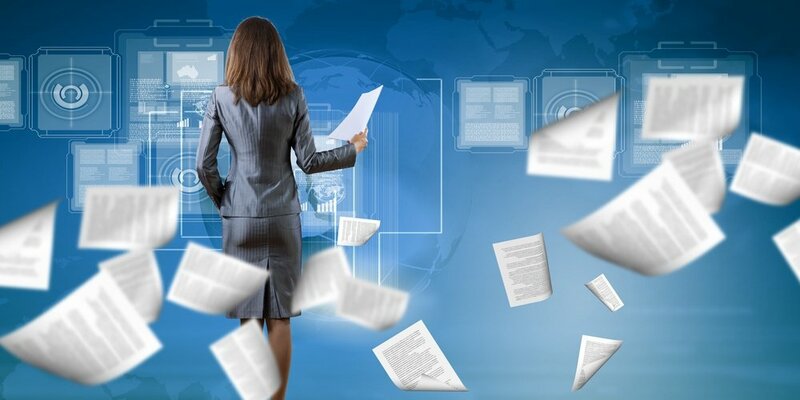 So why not make it easy to integrate our Enterprise Document Management with our mail? Collabware has built Collabmail to do just that. 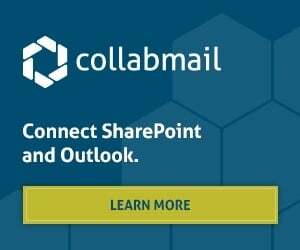 Collabmail offers a simple yet feature rich window into your SharePoint world that includes O365 sites and OneDrive as well as most versions of On-Premise SharePoint or any combination. With Collabmail you can easily add sites as favorites and control your view into SharePoint. You can drag emails and their attachments or just their attachments into SharePoint or drag them from SharePoint into a mail. You can edit SharePoint metadata from Outlook and even move content from your file structure into SharePoint via Outlook. My mailbox with Collabmail installed on the right. 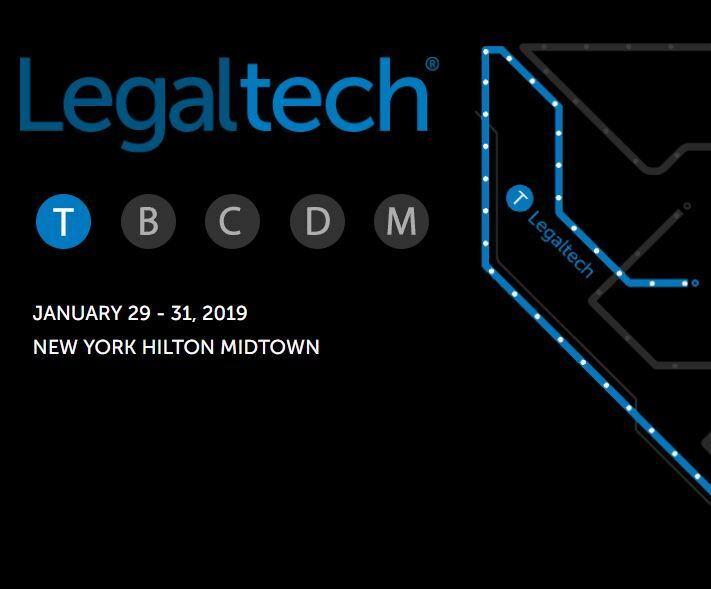 If you find yourself in Outlook all day and struggling with SharePoint, Collabmail can be a window that will help you see the landscape of document management without losing focus. Getting content from where you are working (Outlook) to where you need it (SharePoint) in an easy and effective way is really the first steps of Enterprise Content Management in SharePoint. Look out for the next in the series: Cradle to Grave: Part 3, Toddling: Getting Control of Your Content and Making it Walk.